Without doubt bubble, sparkle and glitter are my favourite words. It’s a well known fact that you can’t say the word ‘bubble’ in an negative tone and I should know – I grew up around a West Ham United family. 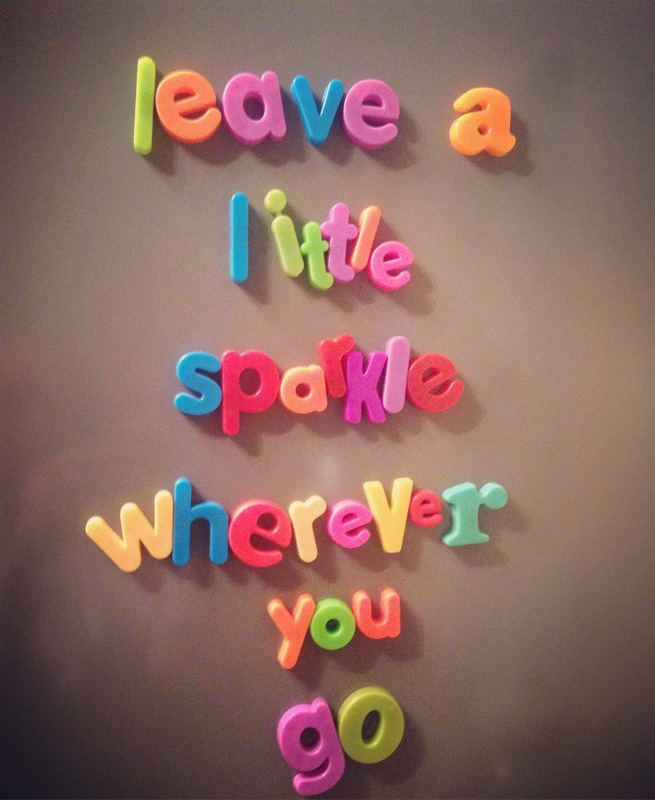 Sparkle is a close second – in all honesty I prefer ‘sparkly’ as is just has a bit more jazzle to it. Anyway back to us leaving sparkle wherever we go…first we should probably give some depth to ‘sparkle’. For me it’s simple, it’s not a literal sparkle; I’ve done this many a time from glittery nail varnish on my mums sofa to wedging confetti in friends cards – neither was met with cheer. For me the act of leaving sparkle is more a glimmer of happiness wherever I go. ‘Wherever’ is an important word too…this means the Dentist, the petrol station and not just when you see friends or have planned ‘sparkle moments’ (yes I’ve made that a thing now). Why not randomly take some cakes into work with you for no reason. Buy flowers for a friend ‘just because’ and when you see people and they ask you how you are and you then ask them, make sure you actively listen to them. Listening can be its own reward, it means your knowledge expands – little is learnt by talking, after all you already know the answers. Listening however, is a skill that most of the world hasn’t even tried to improve at. Compliments are a great way of leaving sparkle, compliment the cashier at the till on a busy Saturday morning when they feel invisible and you’ve practically tinselled their day. Text a friend out of the blue a positive memory you shared and they too will feel your sparkle. Even better – make time to call a friend and have a really good natter; keep your info brief and concentrate on positive messages, compliments and happy memories. If you want to leave a tsunami of sparkle then be really upbeat when others are in a negative mindset. For example being joyful on a Monday morning in the office, complimenting the grey skies, or taking time to dress up on a Friday when the world is closing down and heading for their Comfy jeans and trainers. This is hard and can make you feel really drained but the vibes you throw out to the universe are always well recieved, if not by the recipient intending it will ricochet back to you. That’s how the universe works. I love this technique, if I’m feeling a bit blue I often bless the people around me (usually in my head), even if they are strangers in cars whizzing past me on the motorway. It makes me feel fabulous and even if they don’t take the blessing or compliments / the universe sends it back to the receiver…winning! Maybe lately your sparkle levels been low, your glitter gage is at zero and maybe…you haven’t made anyone a cup of tea since 2012. Let this week be the time that you make the effort to sparkle, I promise only good can come from it, if not for the world around you but you yourself. Enjoy and spread that sparkle extra thick. This is the best praise one can review…love for sparkle days, may you have many more.